IL-14T FLA-01146 in a fresh and good-looking coat of paint at Moscow-Myachkovo in June 1995. Photo by "Yakfreak". Click on the photo for a larger image. In the mid 1990's Mr. Reto Seipel, a Swiss airline pilot, first started thinking of an entertaining way to combine aviation and travel with a culinary stay at a fine restaurant. The idea behind the restaurant would be to re-create the golden age of flying, the true age of piston props and levels of customer service and respect which unfortunately don't exist anymore. Developing this idea into a workable concept took many years, and this page is about a small part of Reto Seipel's effort: the aircraft which became the centerpiece of the project. For this Reto first looked at a DC-3 or a Convair 440 Metropolitan, but both proved to be very expensive. Through a friend he started looking around in Russia, and found... a rare Ilyushin IL-14. 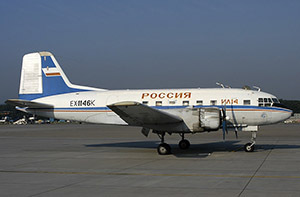 The aircraft Reto Seipel and his team located was an Ilyushin IL-14T, which was built at the Chkalov Plant in Tashkent in 1957, as manufacturer serial number 7343408. It was delivered to the Soviet Air Force, but much is uncertain about the aircraft's early years. A rare photo of this aircraft in the colours of the Soviet Air Force, marked as "21 red". Photo taken on 13 April 1992 at Moscow-Myachkovo by Adrian Morgan. Click on the photo for a larger image. What is known is that at one time it received the code "21" in red on the rear fuselage (aircraft "21 red"). The Air Force calls this the Bord Number. The Soviet Air Force operated "21 red" in an overall green camouflage scheme and based it for some time at Moscow-Chkalovskaya, otherwise known as Star City, the Cosmonaut training center north-east of Moscow. 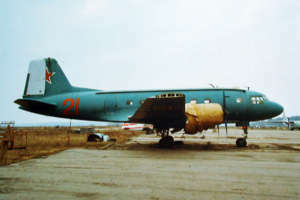 "21 red" served with the VVS (Russian Air Force) until it was withdrawn from use on 30 March 1991, with a total flying time of 9,148 hours. It was due to be scrapped, but this was prevented by a few Russian Air Force officers and it was sold to a private person instead. The aircraft was ferried to Moscow-Myachkovo airfield, repainted in its current colour scheme with "РОССИЯ" titles (cyrillic for "Rossiya"), and re-registered on the Russian Amateur Aviation Federation's register - "21 red" became ФЛА-01146. The letters ФЛА are cyrillic for FLA (Federatsiya Lyubitelei Aviatsiï) and were painted on the wings only. The fuselage only carried the number 01146, without any prefix. 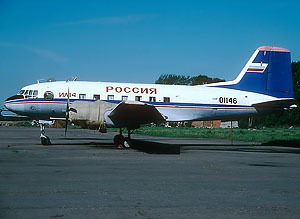 Early 1996 ФЛА-01146 (or FLA-01146) was moved to Zhukovsky airfield, also near Moscow, and by 1999 the aircraft had accumulated a total flying time of 9,151 hours. 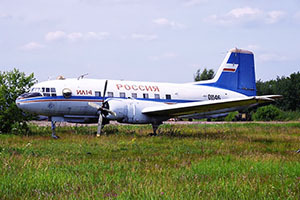 Aircraft FLA-01146 parked at Zhukovsky airfield on 29 June 2002, and photographed by Dave Russell. Click on the photo for a larger image. It was there at Zhukovsky airfield that Reto Seipel and his team found it in 2002. 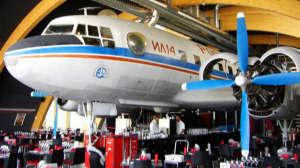 In early 2004 negotiations were started with Mr. Oleg Parfentiev, who was to purchase the aircraft from the previous private owners, organize the airworthiness certification process and handle the basic maintenance of the IL-14 before it was flown out to Switzerland. Reto Seipel, or rather Runway Restaurants AG (the name of the holding company running the restaurant), would then take ownership after the aircraft had safely landed in Zürich. 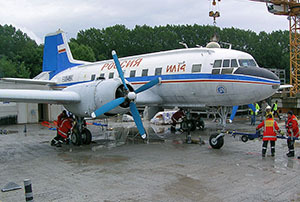 All was agreed upon, and Mr. Parfentiev started work on the IL-14 to make it airworthy and meet local air regulations. 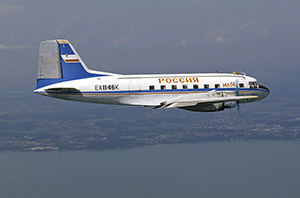 The first test flight after maintenance work was accomplished successfully on 7 April 2005 from Zhukovski airfield, bringing the total flying time of the aircraft to 9,160 hours. In August 2004, Russia had put a stop on all new Russian experimental registrations, and Mr. Parfentiev had to register the aircraft in Kyrgyzstan. ФЛА-01146 became EX-1146K in May 2005 and was granted a temporary certificate of airworthiness based on its intended ferrying to Switzerland. Fitted with two Ash-82T piston engines, the aircraft was deemed airworthy for the purpose of a ferry flight. A further test flight occurred on 24 June 2005, and the pilots then also practised their landings. Still going strong! This almost 50-year old aircraft nearing the end of its last flight ever. Photo taken on 26 June 2005 by Peter Lewis / goatworks.com. Click on the photo for a larger image. 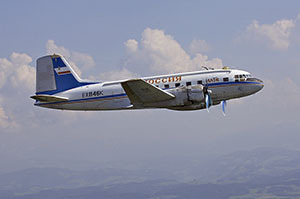 On 25 June 2005 the aircraft's crew (captain Jurij Kabanov, co-pilot Viktor Zabologskij and navigator/mechanic Sergej Dushin) and passenger/owner Oleg Parfentiev boarded the old Ilyushin IL-14, for the first leg of the delivery flight to Switzerland. The uneventful flight went from Zhukovsky airfield to Brést, Belarus, and lasted 4 hours. The original plans called for refueling in Brést, but the crew did not trust the quality of the Avgas there (too high water content was presumed). The plans were changed and it was decided to fly to nearby Warsaw instead, and refuel there. The next morning, 26 June 2005, EX-1146K took off again for the short second leg of the ferry flight, bound for Warsaw, Poland, a mere 180kms to the west. A rare sight in 2005. Ilyushin 14T EX-1146K in mid- air over Lake Constance (Bodensee) in Switzerland. Photo taken on 26 June 2005 by Peter Lewis / goatworks.com, from a Yak-52 chase plane. Click on the photo for a larger image. At Warsaw, the tanks were filled up with proper Avgas, but with this being an unplanned stop, the crew did not have enough cash with them to pay the local fuel company. Arrangements were made with the local Swiss station manager to help them out, and in the early afternoon of 26 June 2005 EX-1146K took to the air again, for the final leg, to Zürich, Switzerland. This would be the aircraft's last flight ever. The Warsaw-Zürich leg took 4.5 hours, and during the last stage of this flight, around 16:35-16:40 local time on Sunday 26 June 2005, an air-to-air session was set up with Yak-52 LY-RED over Lake Constance (Bodensee) near Kreuzlingen. After that the IL-14 was guided into Zürich Airport using VFR landing route 3, making an overhead left hand downwind visual approach for runway 28. At 16:50 local time the venerable aircraft made its final landing at Zürich, and it was as uneventful as the rest of the flight had been. Ilyushin IL-14T msn 7343408, 48 years old, had made the long two-day flight from Moscow to Zürich without any serious technical problem whatsoever. Zürich, early morning, 27 June 2005. EX-1146K resting after the long flight from Warsaw. Photo by Rolf Wallner. Click on the photo for a larger image. After arrival, SR Technics (one of Zürich's technical services companies) removed the fire extinguishers, and drained the hydraulic oil and the remaining Avgas fuel. On 3 July the aircraft was cleaned, and three days later the silver rudder was sprayed blue to match the rest of the vertical stabilizer. 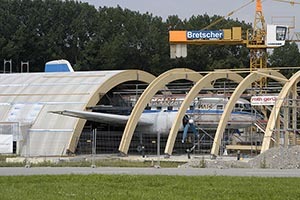 One day later, on 7 July, the aircraft was towed from SR Technics hangar across the airport and over the airfield boundary fence (which was removed especially for this) and positioned on the restaurant building site, just to the south west of Zürich’s main runway 16/34. There the new restaurant will be built around EX-1146K, making it the centerpiece of the restaurant project, adjacent to Zürich International Airport, suitably known as "Runway 34". The restoration of the aircraft itself will be a cosmetic makeover only. The cockpit, navigator and radio operator's positions will be tidied up and the ceiling insulation will be replaced. Glass or perspex will be used to seal off the cockpit area, to keep "small souvenirs" from disappearing. The main cabin area will be transformed into the smoker's lounge, with sets of seating and tables spread evenly along the length of the fuselage, and the rear wall just in front of the two passenger doors will be removed. 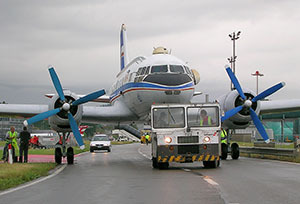 Ilyushin 14 EX-1146K being towed to its final resting place. Photo copyright Peter Lewis / goatworks.com Click on the photo for a larger image. This is where the old aircraft will most likely spend the rest of its life. Photo copyright Peter Lewis / goatworks.com Click on the photo for a larger image. A large electronics box in the passenger cabin (forward left), which was being used as a table, is rather in the way and may also be removed. The lavatory area will become the cigar humidor and the rear left main door will be used as the main entry to the aircraft. The right hand side door will be the fire escape only. External restorations will be limited to a few local "touch-ups" to cover dents or rust. The colour scheme looks good enough and will remain unchanged, and the registration EX-1146K will revert to ФЛА-01146. The EX registration was cancelled from the Kyrgyzstan register around 1 July 2005. This photo by Rolf Wallner, taken on 18 July 2005, shows that no time is being wasted. A few more days and the aircraft will be completely hidden from view. Click on the photo for a larger image. On 8 July scaffolding had been erected around most of the aircraft on the building site, in preparation of the completion of the roof and wall structures. Around mid July about half of these structures were already in place around the aircraft, with only the vertical tail and the outer wings still sticking out. The EX- registration was removed from the aircraft on 16 July 2005. The leading zero, which was crudely sprayed out by the Russians when the EX registration was applied in May, was re-applied, and the Ilyushin now again carries the number "01146" on the fuselage. 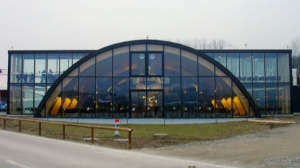 Work on the site continued at a steady pace, and the hangar-shaped restaurant officially opened its doors on 13 October 2005. The outer wings are surrounded by glass extensions to the main building, and only the top of the tail, appropriately numbered "34", is still sticking out from the roof of the restaurant. The restaurant offers a very nice view of the activities at Zürich-Kloten International Airport. The concept of the new restaurant seems to be successful. Business at the restaurant is very good, and there are now plans to buy a second Ilyushin and build a second restaurant at one of Switzerland's other airports, possibly Geneva, within three years. Hopefully this will indeed happen! The "Runway 34" restaurant is located at Rohrstrasse 67, 8152 Glattbrugg, Switzerland. The old Ilyushin 14T as a wonderful eyecatcher in the center of the new restaurant. Photo taken by Lawrence Safir on 26 June 2006. Click on the photo for a larger image. And this is what the restaurant looks like from the outside. It sure seems like a nice place to have dinner! Photo taken on 24 Febrary 2006 by Jens Schinke. Click on the photo for a larger image. Special thanks to Peter Lewis/goatworks.com/Restaurant "Runway 34" for supplying me with truckloads of information and for the kind use of his photos. Many thanks also to Rolf Wallner, Dave Russell, "Yakfreak", Lawrence Safir and Jens Schinke for the use of their photos, and of course to the authors of Soviet Transports, who helped to supply many additional details about the aircraft's history.